Sweet potatoes are among the healthiest and cheapest vegetables in the world, and some day even in the space, since NASA chose them for their space missions. They can be even considered as a super food. The aim of one Washington University study was to discover which vegetables contain the most nutrient per dollar. The Anti-Cancer Potential of Sweet Potato Proteins video presented below, shows a graph of nutrition versus availability for various foods. Dark green leafy vegetables as one of the healthiest foods are also one of the cheapest, while the scores for the most nutrient-rich food per dollar turned out to be sweet potatoes. Not only that sweet potatoes are rich in nutrients, but they also possess anti-cancer properties. Back in 1931, sweet potatoes were discovered to possess a unique protein. As a matter of fact, 80 percent of sweet potato protein is a protease inhibitor type which has potential anti-cancer properties. Initially, these potato’s proteins were tested against blood cancer, leukemia, and it showed to subdue growth of leukemia cells in a petri dish. The moment majority of proteins hit the stomach, they start to digest. In order to get around the problem of digestion, scientists tested sweet potato proteins against cancer cells on tongue, having in mind that they certainly touch our mouth. Since patients with tongue cancer are generally treated with chemotherapy, and the chemo drugs they use have harmful effects, discovering alternative therapeutic strategies is necessary. The protein of sweet potatoes diminished the in vitro cancer viability in just couple of days, which led scientists to suggest that sweet potatoes may be beneficial for tongue cancer in humans. Researchers tested this unique class of proteins on 9 women with advanced cervical cancer, 2 of which showed that this protein class survives the digestion process and can be absorbed in the bloodstream intact. It was not long ago when sweet potato proteins were tested on one of the most common as well as deadly type of cancer, the colorectal cancer. The colon is removed surgically while in the early stages, since very often there are “micrometastases” which appear outside the colon and can result to recurred cancer and death. This is why scientists have been looking for anti-metastatic agents. 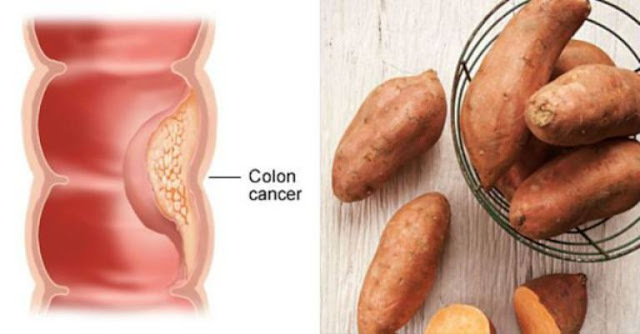 The sweet potato protein does a lot more than slowing down the development of colon cancer cells. It also reduces the cancer cell invasion and migration.